The visionary inventor Buckminster Fuller once said, “I just invent, then wait until man comes around to needing what I’ve invented.” Some existing technologies, such as horizontal drilling, “wait around” until a new generation of innovators recognize their intrinsic value and adapt it for current needs. After being first used in the 1920s, horizontal drilling became one of Chevron’s major tools in the 1980s and today, it’s being used more innovatively and yielding outstanding results. From the waters of the North Sea to shale formations in the United States, horizontal drilling helps us recover up to 10 times the resources from existing fields. Horizontal drilling helps us reach resources that would otherwise be too uneconomic or complex to pursue. The U.K.’s Captain Field languished after its discovery in 1977 because its shallow reservoir consisted of loose, unconsolidated sand that would have required about 300 wells to produce. Eventually, advances in horizontal drilling provided the technology that enabled us to unlock that oil. In 1995, we needed just seven extended horizontal wells in an environment that was like manipulating a piece of string from a mile away in the dark. But it worked, as we produced oil from a horizontal section more than 5,000 feet long — a North Sea record at the time. In 1997, 20 years after its discovery, Captain achieved first oil, thanks to developments in horizontal drilling and downhole pumps in the well bores. And it has been producing ever since with help from further horizontal drilling, which we’ve brought back to increase production by accessing untapped reserves. Horizontal drilling efficiently recovers more resources with a smaller environmental footprint than drilling multiple vertical wells. "Bend It like Beckham" was a movie about a British football star who could “bend” or curve a kicked ball around a row of defenders. Horizontal drilling is a bit like that. Take the case of our Marcellus Shale unconventional oil and gas assets in Pennsylvania. Horizontal drilling gives us greater access to the reservoir by using a rig to drill down thousands of feet into the targeted production zone. The drill then probes thousands of feet horizontally through the shale. This approach efficiently recovers more natural gas with a smaller environmental footprint than drilling multiple vertical wells. It’s particularly effective because the Marcellus terrain is quite hilly, limiting the flat areas on which to place a drilling rig. So laterals — or horizontal sections — can push farther, with greater success. And we’re getting more efficient at using the technology, cutting safe drilling time in half and doubling our productivity. Used in combination with another technology — hydraulic fracturing — horizontal drilling is enhancing production flow rates in the Marcellus Shale and other unconventional oil and gas holdings. Horizontal drilling also helps us design our wells with control systems to protect groundwater through the life of the well. Chevron combines two proven technologies – horizontal drilling and hydraulic fracturing – to safely produce natural gas from shale. Natural gas from shale is being developed safely and responsibly today using technologies that have been proven over decades of use. Horizontal drilling became commercially viable in the 1980s. Hydraulic fracturing has been used since the 1940s in more than 2 million wells around world. In the United States, 90 percent of oil and gas wells undergo hydraulic fracturing to enhance production flow rates. Chevron is pursuing advancements in technology and applying industry best practices throughout the full development life cycle to efficiently produce shale gas while protecting the environment. Shale rock formations are located up to 3 miles below the earth’s surface. 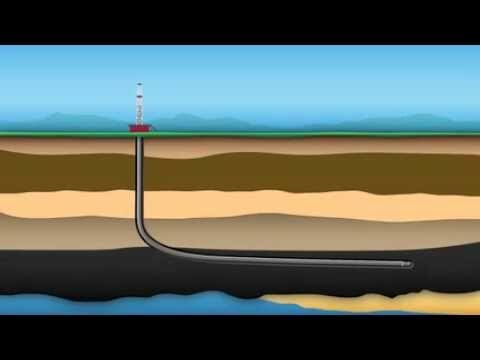 Producing natural gas from shale is made possible by extended-reach horizontal drilling, to access the resource, and hydraulic fracturing where water under pressure is used to fracture the rock, releasing the trapped gas. Once completed, these wells are expected to produce for 40 to 50 years. See how we’ve developed new shale gas technology and how that technology has improved natural gas production. Horizontal drilling is helping to enhance production and recovery from old oil fields. At the century-old Kern River Field in California’s San Joaquin Valley, horizontal wells drilled with steerable tools allow us to effectively access remaining oil, achieving higher production rates and greater recovery than vertical wells. Directional control is maintained within tight tolerances during drilling operations and logging tools allow us to monitor and react in real time when we’re deviating from the target formation. The result: We’ve significantly reduced Kern River’s decline, due to the higher production rates from horizontal wells. Elsewhere in the San Joaquin Valley, horizontal drilling is achieving similar results. A good example is the San Ardo Field, where horizontal drilling is enabling us to increase production by improving drainage from the heated portions of a much thicker reservoir. Chevron’s commitment to safe and responsible energy development shapes everything we do and every decision we make. Our drilling activities are designed to protect our workforce, the communities where we operate, and natural resources, including water, land and air. Our use of horizontal drilling enables us to gather natural gas from a large underground area with minimal surface interference, limiting our environmental footprint. With a single pad, for example, we can produce from an area of about one square mile. And the wells for our shale operations are designed and drilled with control systems to protect groundwater throughout the life of the well. Similarly, our Subsea Mudlift Drilling (SMD) has the potential to make our safe and efficient deepwater drilling operations even safer. Since mud isn’t needed in the riser to control the well, it restores the riser margin, re-establishing an even greater level of safety than in the single-gradient systems currently in use. SMD allows drillers to more quickly detect and appropriately react to downhole pressure changes, enhancing the safety and efficiency of deepwater drilling operations. Smart use of our technology will remain instrumental in the success of our base business and major capital projects, and on our long-term goal of achieving industry-leading results for decades to come. Advances in drilling technology will continue to take us into places that were previously inaccessible or uneconomic to drill. Horizontal drilling, combined with hydraulic fracturing, will continue to help us ramp up production of oil and natural gas from shale and tight resources ranging from Loma Campana in Argentina to the Permian Basin in West Texas and Southern New Mexico. We have a particularly strong legacy position in the Permian’s multiple, stacked tight oil zones, which are poised to deliver long-term growth. Elsewhere in the United States and Canada, we’ve also increased capital spending to apply horizontal drilling and hydraulic fracturing to grow our shale and tight oil production. We’ll also continue to build on our leading position in the deep waters of the U.S. Gulf of Mexico and other areas. Subsea Mudlift Drilling will become a significant tool in enabling us to drill more efficiently and safely in these deep waters.